Emma Goldman is best known as an anarchist who helped to propel labor movements within the US and abroad. In addition to her labor activism, Goldman was a proponent of woman's rights and sexual freedom. The New York University Emma Goldman Paper Project aims to highlight a more personal history of Goldman one that shows her private life and the intersection of her public persona. 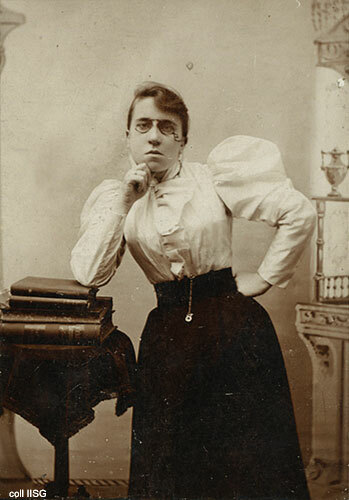 By partnering with the University of California at Berkley Emma Goldman Paper project, updated and never before seen correspondences and articles written to and by Emma Goldman will be digitized and posted for public viewing. The outcome will be a more easy to use and sophisticated web site that highlights primary sources as well as interpretive pieces. While some of Goldman's papers are digitized, this collection will add and enhance the current scholarship. The collection is only available at the Tamiment & Robert F. Wagner Labor Archives at New York University.